You can help build the Ohio Food Policy Network at this week’s annual conference of the Ohio Ecological Food and Farm Association. The network is a “group of food policy stakeholders committed to the development of a just and sustainable food system,” according to the conference program. They’re “engaging concerned citizens across the state to map a vision for the future” — and a session at the conference will do just that. Two of the facilitators are from Ohio State. 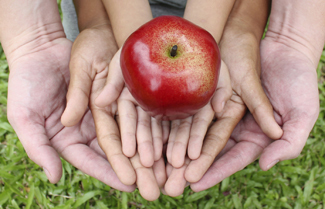 “Ohio Food Policy Network: Mapping the Vision for Ohio’s Food System,” Session V, 1:30 to 3 p.m., Saturday, Feb. 11. Complete conference schedule. Ohio State’s Wexner Center for the Arts, two Los Angeles-based artists, Columbus neighborhood groups and collaborators including CFAES’s outreach arm (OSU Extension) are partnering to design and plant two public “fruit parks” in Columbus’s Weinland Park and South Side areas. “The fruit each location will yield is intended for the community to share and will be selected with an eye towards the history and preferences of each neighborhood,” said a Wexner Center press release. Ohio’s nearly 3,000 Master Gardener Volunteers share their plant-related knowledge with other people, and that knowledge improves, among other things, urban farms and backyard gardens. In turn, those farms and gardens reduce hunger, improve health and create income. Learn more about the statewide program here. It’s run by CFAES’s outreach arm, OSU Extension, and offers training and volunteering in all 88 of Ohio’s counties. In Wayne County, for instance, CFAES’s Secrest Arboretum just announced it’s taking applications for its 2017 Master Gardener training course. The deadline to apply is Jan. 27. 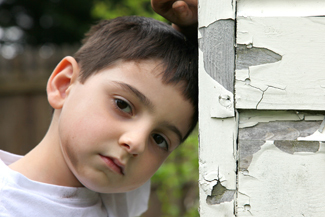 More than 630,000 Ohio children live in food-insecure households — they aren’t sure where their next meal is coming from. That’s enough to fill Ohio State’s football field, Ohio Stadium, six times over. 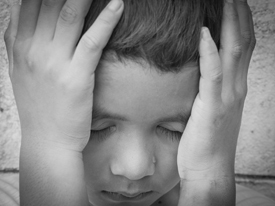 “One of the biggest misperceptions I’ve seen about hunger in Ohio,” CFAES’s Pat Bebo says, “is that people think it occurs only in very poor households.” Read the story. 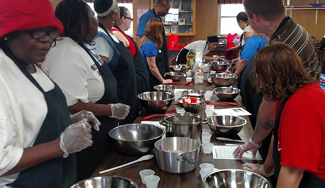 A program called Produce Perks, which CFAES’s outreach arm, OSU Extension, helped establish, is tackling northeast Ohio’s urban food deserts and boosting food security. 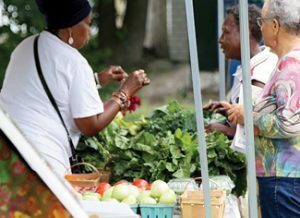 “Families can stretch their food dollars by utilizing Produce Perks to double their whole-food purchases,” says Veronica Walton, who manages Cleveland’s Gateway 105 Farmers’ Market (shown here last summer). 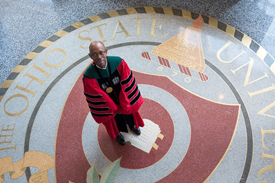 Ohio State’s faculty-staff newspaper, onCampus, covered the “Vision 2020” speech by Michael V. Drake during his investiture ceremony March 31 as the university’s 15th president. It’s all good reading — click here — but scroll down especially to the fourth part, “Drake makes unprecedented commitment to food security,” as it’s right in CFAES’s wheelhouse. It’s one of our Signature Areas. And it stands to change more lives than you may think. Despite impressive hunger-fighting efforts and an Ohio agricultural industry worth $100 billion, “At this moment, blocks away, children may not know where they’re getting their next meal,” Drake is quoted saying. “This is unacceptable.” Read the coverage.